Are you ready for Red Sun Rising?? The latest rock phenomenon are on tour with their epic sophomore album, “Thread.” They’re on their way to the Stage AE on Wednesday 7th November 2018. Tickets are expected to sell out FAST so don’t miss out – get yours NOW while they last!! 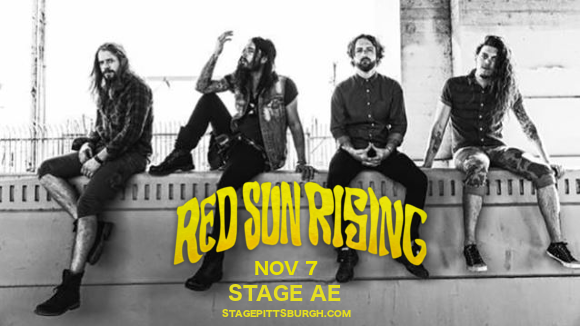 Formed in 2006, Red Sun Rising are one of the most sonically diverse bands to surface in the last decade. Currently comprised of Mike Protich, Ryan Williams, Dave McGarry, Ricky Miller, and Pat Gerasia, Red Sun Rising saw their singles "The Otherside" and "Emotionless" reach number 1 on the Mainstream Rock chart, making them only the second band to have two songs hit the number one spot from the same album. “Thread,” has been loved by audiences and acclaimed by critics. Grab a copy for yourself if you haven’t yet – and then book your tickets to see the band live, as you’re sure to want to! !